Students listen as attendees express frustration over perceived racism at Loyola. 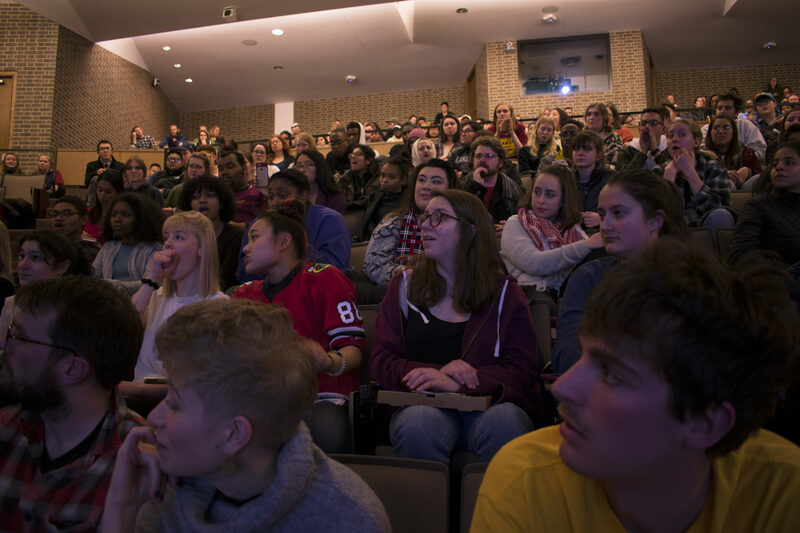 Tensions came to a head Thursday night as more than 300 people packed into Galvin Auditorium demanding action and accountability from Loyola in the wake of a student’s arrest on campus by campus police officers. The town hall came after the university’s Campus Safety arrested Loyola student Alan Campbell, and amid allegations officers also used excessive force to detain student Paloma Fernandez, outside the men’s basketball game Feb. 24. The two students were protesting the funding of a new athletic facility when they noticed Campus Safety officers searching two black men outside the game in the Damen Student Center. The university said these two men were scalping tickets and that Campbell and Fernandez interfered with the search. Campbell and Fernandez have both denied the allegations they physically interfered in Campus Safety’s search. Cell phone video of the incident shows Campbell on the ground being handcuffed by officers and Fernandez being grabbed by the collar by a Campus Safety officer and pushed up against a wall. Campbell was arrested and eventually released. Earlier this week, organizers planned a walkout and circulated an online petition in response to the incident. More than 500 students walked out of class Wednesday and the petition has received more than 1,500 signatures, Fernandez said. Loyola President Jo Ann Rooney issued a statement Tuesday which stated the university wants to do more to work with minority students to address racial issues on campus. The town hall’s organizers demanded a full apology, an admission of fault for Saturday’s incident from the university and for Campbell and Fernandez to be absolved of any disciplinary measures. They also demanded the involved Campus Safety officers be fired immediately. Additionally, they called for a new, fully transparent investigation process for ethics complaints against university employees, and cultural sensitivity and de-escalation training for Campus Safety officers. Three Loyola administrators attended the event: Dean of Students Will Rodriguez, Assistant Dean of Students Tim Love and Assistant Dean of Students Kimberly Moore. Rodriguez said he came to the event of his own volition and to gauge the opinions of the student body. 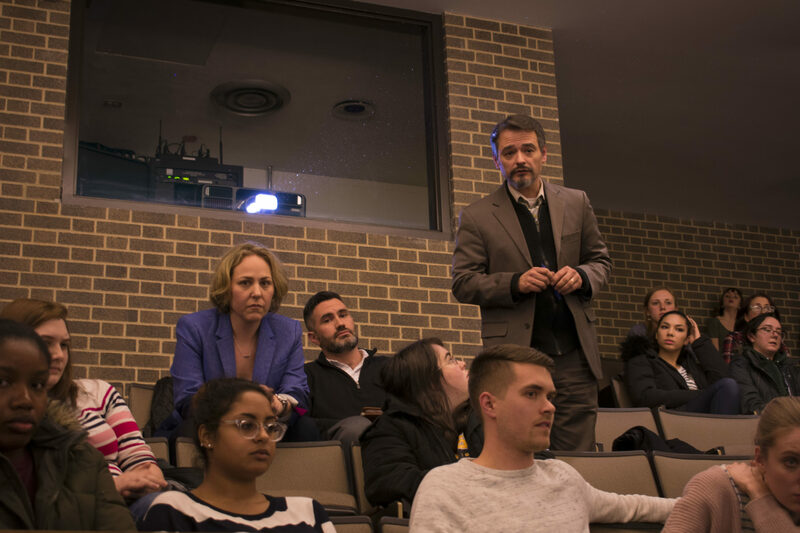 Dozens of students openly booed and chided the administrators for not issuing an in-person apology when asked at the town hall. Many questioned why Rooney was not in attendance. The floor then opened up and students shared their experiences of racial biases on Loyola’s campus. Students told stories of feeling ostracized on campus as members of minority groups and stories of being stopped and questioned by campus police officers because of their race. Solomon Collins, a 22-year-old senior, was one of the many black students who said they’ve been profiled by police on campus. Following the event, Fernandez said she was pleased with the turnout and called on the university to do more. Campbell declined The PHOENIX’s request for comment following the town hall, but spoke during the event. He said the university is a “dirty institution” that has been a part of “active victim-blaming” and makes excuses for systems that are not in favor of students of color. The Town Hall was sponsored by Loyola’s branch of the International Socialist Organization, the Black Cultural Center, Students for Reproductive Justice, the African Student Alliance, Students for Justice in Palestine, Loyola Young Democratic Socialists and Undocumented and Proud Loyola. The organizers concluded by planning a protest for March 2 at 12:30 p.m. in front of Burrowes House. Loyola University Chicago’s marketing did not return request for comment at the time of publication.